Greathouse Point > Greathouse Archives > USA > PA > Philadelphia County > 1750 - Will: Anthony Hinkle Jr.
Do you have any Greathouse kith and kin who resided in Philadelphia County, PA? If so, please join us in our efforts to better document the Greathouse kith and kin who lived in this county, by sending your additions and corrections to Greathouse Point. 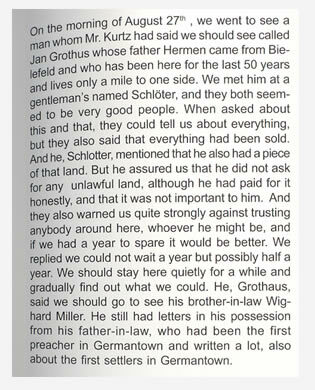 1764, Aug 27 - Journal of Johannes Herbergs: "Hermen [Grothus] came from Bielefeld"
On the morning of August 27th , we went to see a man whom Mr. Kurtz had said we should see called Jan Grothus whose father Hermen came from Bielefeld and who has been here for the last 50 years and lives only a mile to one side. We met him at a gentleman's named Schloter, and they both seemed to be very good people. When asked about this and that, they could tell us about everything, but they also said that everything had been sold. He, Grothaus, said we should go to see his brother-in-law Wighard Miller. He still had letters in his possession from his father-in-law, who had been the first preacher in Germantown and written a lot, also about the settlers in Germantown. The article above was written and submitted by Vivian M. Taylor in 2006. It was added to the website on 5 Jan 2007. After this book was added to the collections of the Greathouse Archives, the contents were reviewed to search for any additional information which may have been relevant for Greathouse family research. The glossary of the book was found to contain some additional information which merited further study on the individuals and events mentioned. 1. Brave New World: Rhinelanders Conquer America. The Journal of Johannes Herbergs. Edited by Dieter Pesch. 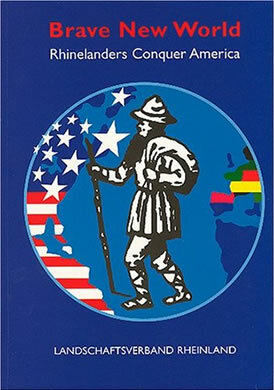 Guides and Papers of the Rheinisches Freilichtmuseum and the Landesmuseum für Volkskunde at Kommern, No. 61. Germany: Martina Galunder-Verlag, 2001. Page 95. 2. This book includes a lot of information about other families in Germantown, some of whom were related to the Greathouses or associated with them. You may order your own copy of Brave New World: Rhinelanders Conquer America. The Journal of Johannes Herbergs at Amazon.com. 3. Maureen Ward, Streeper Exhibition at the Rheinisches Freilichtmuseum Kommern, Germany. View @ The Original 13 Settlers of Germantown, PA.